We pride ourselves on having the most amazing, fresh seafood options out there! It wouldn't be possible without our two main sponsors Blue Island Oyster Company and Claws Seafood Market, who occupy the East and West Pavilions respectively. 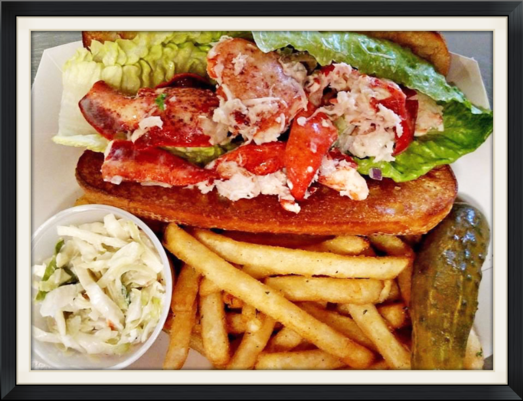 You name it, they've got it - from raw bars to lobster rolls! We also have several seafood trucks and a variety of other, non-fish, food options available at the festival. Blue Island Oyster Company was founded in 1995 with the aim of providing Manhattan restaurants with the highest quality shellfish available, Owner Chris Quartuccio began scuba diving for natural oysters in the Long Island Sound and delivered them fresh, daily to chefs in New York City. Fast forward twenty-one years and Blue Island is now recognized as the number one oyster and clam distributor in the New York area. In addition to producing the world’s only Genuine Blue Point oyster on their farm in the Great South Bay, they supply some of the most sought after oyster varieties in the United States. 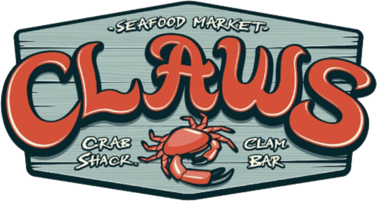 Claws has risen to become one of the best seafood markets and crab shacks on the island. With locations in Sayville and St. James, they have twice been nominated as L.I. 's best fish market. Their outrageous, jam-packed lobster rolls have propelled them to fast acclaim and co-owners Frank Palermo and Chris Meyer continue to challenge themselves by shipping in reasonably priced, untreated exotic whole fish and soak-free seafood from around the world, while remaining committed to local sourcing. When is the Seafood Festival? The festival is held on the grounds of the Long Island Maritime Museum located at 88 West Avenue in West Sayville, NY 11796. There is NO public parking on the festival grounds. What is the entry fee and what is included? The entry fee includes free off-site parking, shuttle buses to and from the festival and all entertainment. Avoid the lines, save time and money. No, the Seafood Festival is a cash only affair. No. Due to space limitations, only handicap and limited vendor parking with proper credentials will be available on site. Furthermore, heavy congestion is predicted for much of South Sayville and the surrounding areas so take advantage of our free parking and shuttle buses and avoid delays! We have secured a parking lot for you to park and take our free shuttle directly to and from the festival. The Baymen Soccer Field Parking area is located at the corner of Cherry Avenue and Tariff Street, West Sayville, NY 11796. You can also take the LIRR to the Sayville station and hop on our free shuttle from the station to and from the Festival. For those taking the LIRR, Shuttles will run to and from the Sayville Station based on the train schedule. What type of entertainment is included? We have several notable acts performing on our main stage. Click here for the performance schedule. The cost of the entertainment is included in the festival admission price. Can I reserve seats for any of the shows? room only and space is on a first-come, first-served basis. EAT! We’ll have plenty of food and drink options for Seafood lovers and landlubbers alike. See the museum's 1888 Oyster Sloop Priscilla, a National Historic Landmark. Our amazing sponsors will be on hand to offer exciting product demonstrations and useful information. Oodles of creative and practical items that appeal to all tastes and budgets will be on hand from artisans throughout the east coast. We will have face painting, sand art, pirate entertainment activities for the little ones. Do I need ID to purchase alcoholic beverages? Yes. The purchase and consumption of alcoholic beverages requires valid photo identification. No. Outside food and beverages will not be allowed into the event. No. Coolers, bottles, cans, or any outside food will not be allowed into the event. No. Dogs or other pets are not allowed on the festival property or into the event. Any suggestions for Festival attendees? 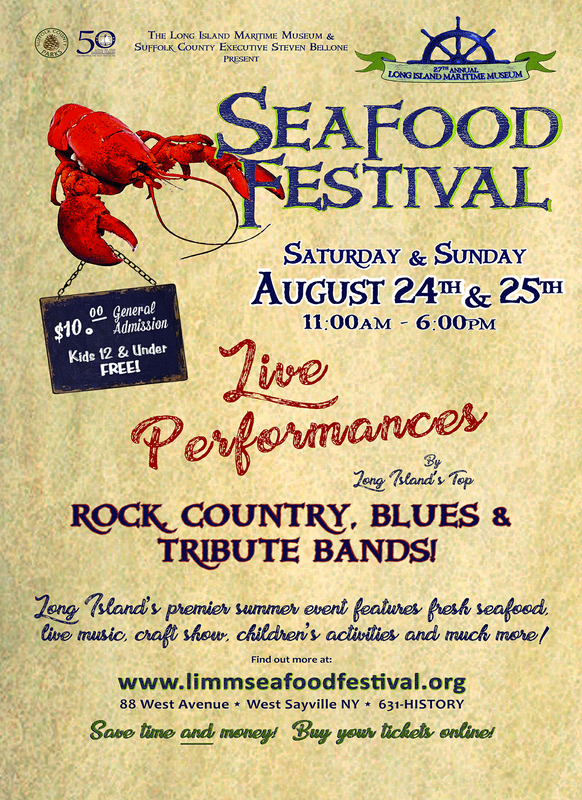 The Seafood Festival is an outdoor event which occurs during what is typically a very warm weekend on Long Island. We have several shaded and protected areas however, those attending should be prepared for warm weather and are reminded that staying hydrated by drinking plenty of water is key. The site is a park and comfortable shoes are recommended. Be prepared to have fun! Where do the Festival proceeds go? the public about Long Island’s rich maritime history. How can I become a festival exhibitor or sponsor? If you are interested in becoming a sponsor or vendor please contact Terry Lister-Blitman at tblitman@limaritime.org or 631-854-4974. Media representatives should contact Terry Lister-Blitman at tblitman@limaritime.org at least one month prior to the event.